Whether it is because of the hot Summer sun, or a hot fireplace during Winter. 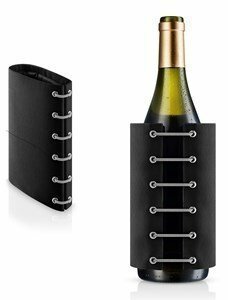 Eva Solo created this wine cooler, elegant and perfect for every occasion. Keep your wine cool for up to 2 hours... so you can enjoy every drop of your favorite wine with your favourite friends! Due to its shape, it is quite compact and easy to store in the freezer. To put it to use, just take it out and dress up the wine bottle. The elastic side elastics add a humorous and functional twist to StayCool, while ensuring that it snuggles any bottle. StayCool is made of nylon with freezer gel on the inside.